In the past few years, accent walls have become a huge trend in interior design. 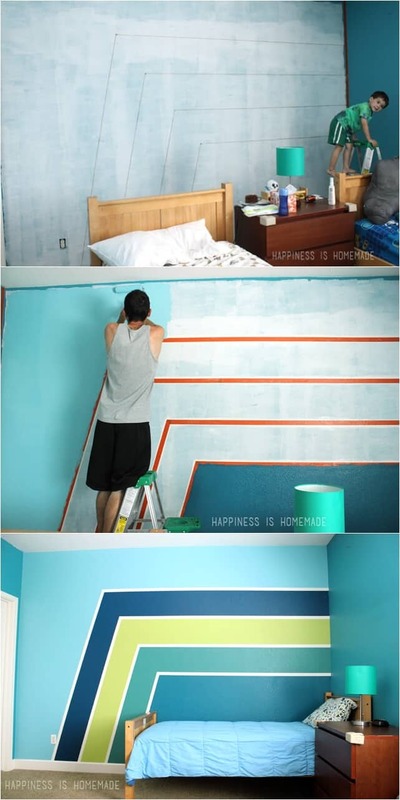 Let’s be honest, decorating every wall in the room can be overwhelming. And you will achieve the total opposite. Instead of adding visual appeal, you will make your room feel and look irritating. 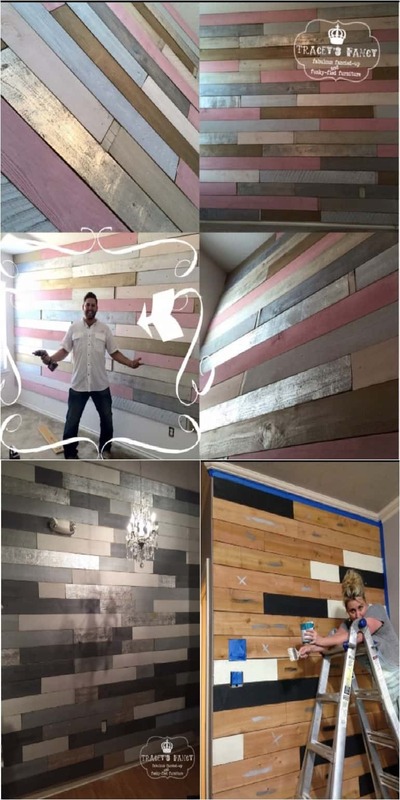 On the other hand, an accent wall will completely change the look of your room. Some people opt for something bold, some for something romantic, and others for an artistic piece. With that in mind, we will look at several DIY decorating ideas for an accent wall. And that is the beauty of it. I am sure you can do this project on your own. One wall is more than enough to make your room look and feel different. So let’s see what you can do. Stencils are a popular ingredient for DIY items. And we start off with a wall made thanks to stencils. These circles look calming and relaxing, and that is just what you need in your living or bedroom. After a long day, you just want to sit back and enjoy. I said there are different ideas and paths you can go for. While some are relaxing, others are more into the spirit of playfulness. 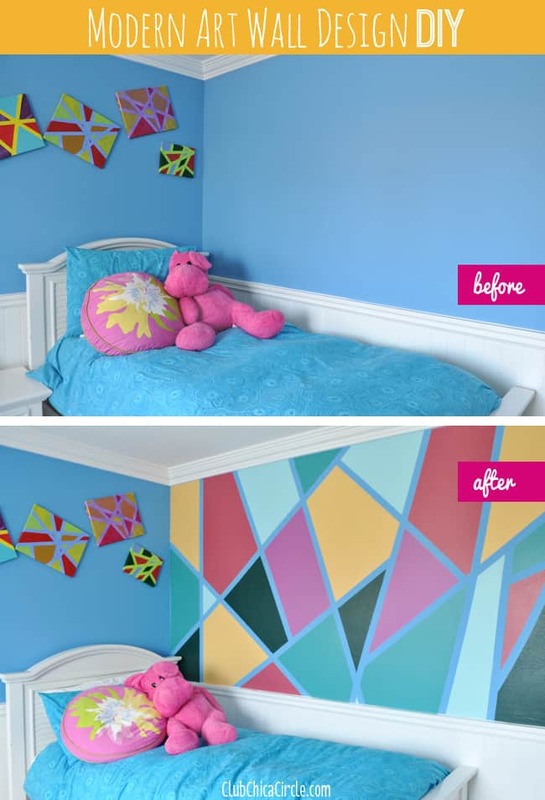 This confetti wall is all about playfulness and adding dynamic to your room. 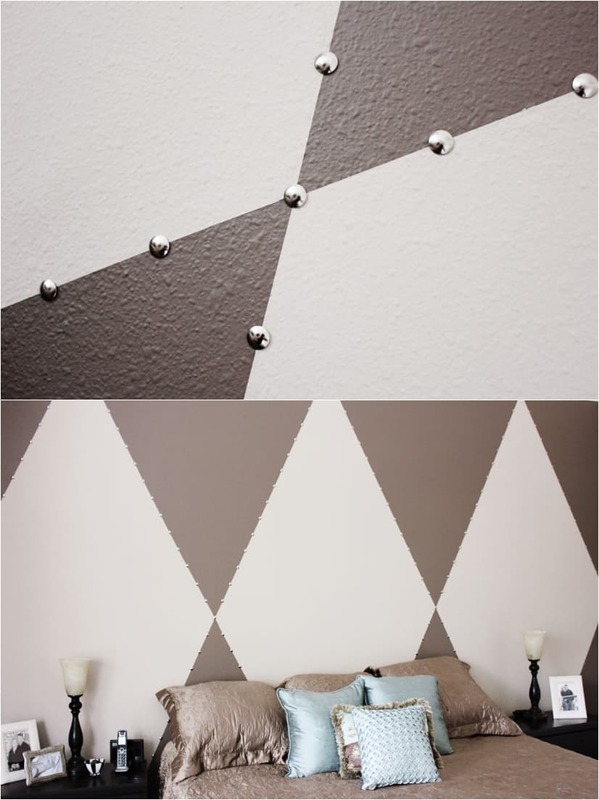 Not only you are getting an accent wall, you are also getting some depth in your room. The extra texture and 3D effect will make your room look modern and contemporary. Geometry has become a huge part of interior design in the past few years. You can say that arguably, geometry is one of the top 5 trends in interior style. And that is all thanks to Scandinavian style where geometric shapes are integral part of the style. But while Scandinavian is more about black and white, you can use geometry to add some color as well. Wood is a perfect way to achieve contrast in a modern home. 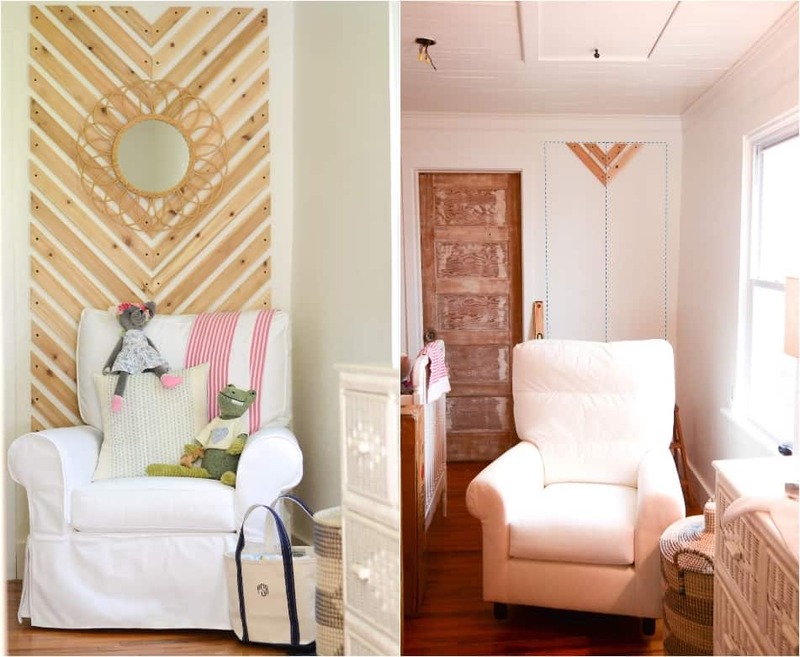 No matter the color of your other walls, wood will fit smoothly. And that is because wood is usually in a neutral brown color, making it perfect complimentary piece. And because wood is more of a traditional material, you can use it for a great mix and match contrast. An accent wall like this one will cost you a small fortune if you try to find it in a brick and mortar store. But if you try and make it on your own, you will save. And just look how awesome it looks. 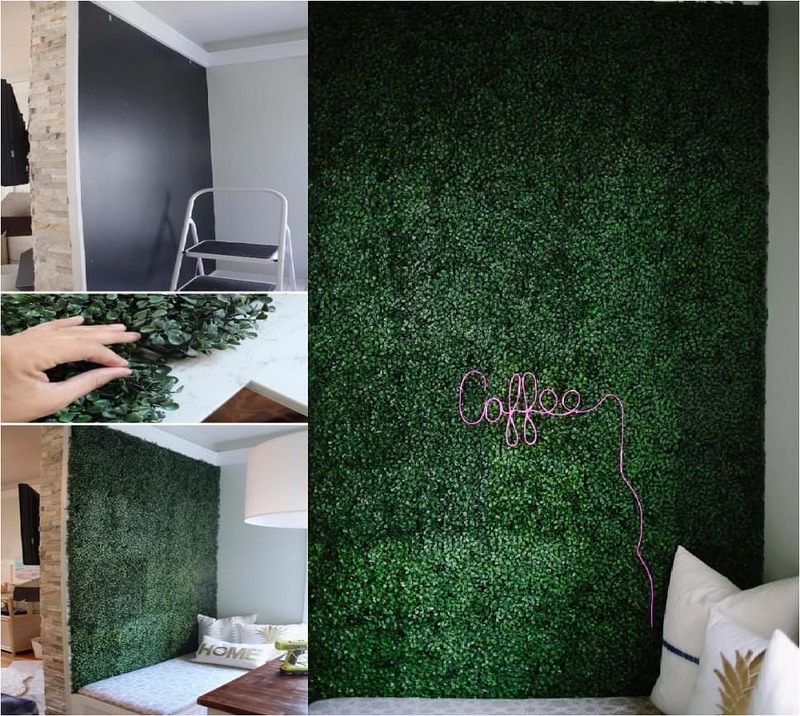 The green color is one of the best for adding calmness and energy in the same time. I must warn you. A dark accent wall is something not many people can pull it off. Dark colors, especially black and gray are extremely challenging to pair. Even some of the best interior designers cannot pull it off. But use this idea as a guiding mark, and you will be fine. The trick with dark accent walls is to keep the rest of the interior rather simple. Faux brick walls have been popular for the last 15 years or so. It seems like they will never go out of fashion. 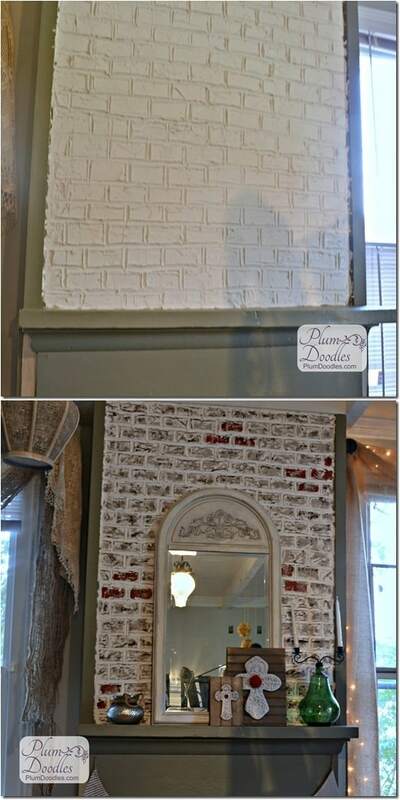 There are many different options when it comes to faux brick wall, and this is just one of those. Some people go for more reddish brick wall. But the white and pale drywall mud will do the trick just fine. If you live in a contemporary apartment or house, this gold wall will fit perfectly. As with the dark accent wall, the trick here is to keep the rest of the interior simple. Gold is more than enough to overwhelm a room. Add in some unique accessories, and you will smother your interior. Another contemporary and modern idea that is perfect for any room. And you can go different routes. For example, in this case, we have different shades of the blue color with some green in there. But you can also try colors of the rainbow if you are feeling colorful. Or any other complementary color combination. As you can see, sometimes all you need is a little bit of paint. No need for complicating things a lot. Just repaint a wall and you are all set to go. 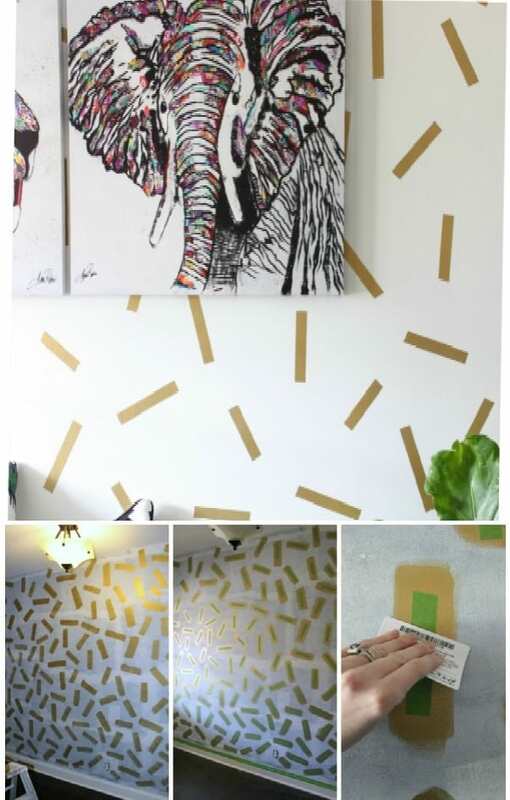 I’ve talked a lot in previous articles about how tape can help you create magic in your home. This is just another perfect example. This project will take a bit of planning and preparing, as you want to keep the lines proportional. But other than that, it is easy peasy. I must say, all of those colors and shapes and boxes can get a little bit overwhelming. You cannot focus properly on one thing. But if that is something you want to achieve, then go for it. Your wall and room will certainly look more dynamic. There is just no escaping the ombre. No matter what industry you are, you cannot escape the ombre. And I must admit, this is one of the best ombre uses I’ve seen. The wall looks so calming and relaxing, you can just fall asleep while watching it. And since this is the bedroom, you can say the wall fits its purpose. We had quite a bit relaxing and calming accent walls. Some of them would make us dreaming of the sea, and others, of the natural wildlife. This one falls into the latter category. 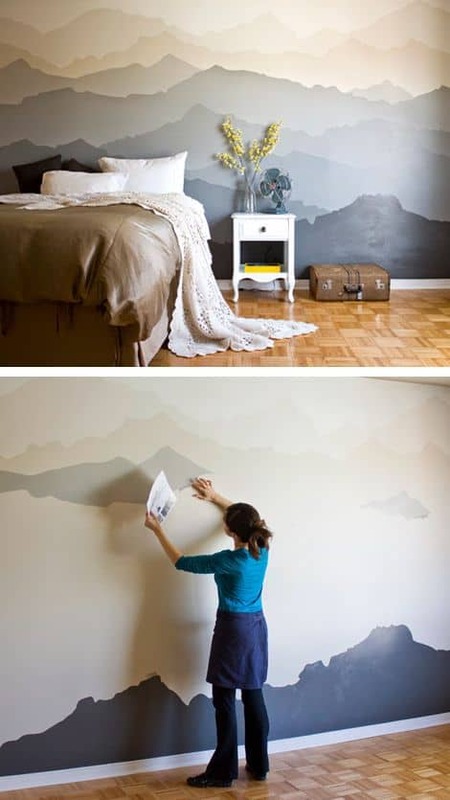 The mountains are always a nice idea, whether it is a travel choice, or a wall art. Just look how simple and easy it is to go from a dull and boring bedroom, to a completely unique bedroom. That is the beauty and magic of an accent wall. And this is one of the better examples for going from zero to hero. I talked about geometry previously. There are many different shapes from geometry you can use. Or different colors. Some go for more vivid and lively, others go for a subtle geometry accent wall. This one falls into the latter category. All of the colors are pale, and the wall serves a purpose of being a relaxing area you can gaze at. Another trend that is rising up in the ranks lately is using metallic colors. Funny enough, the trend started in manicure. Metallic nails are one of the biggest hits in 2017, and now the metallic colors are spreading around. I know we’ve had metallic color on cars for years, but now the colors are becoming more integral part of our lives. I must say, personally, I am more of a calm and relaxing person. So many dots on one wall can be overwhelming for me. But I know there are people that do not mind it. In fact, they embrace the chaos of the dots. We have to have a gaming-inspired and gaming-themed wall. After all, gaming is huge lately. With that in mind, the only downside here is time. As in, you will need a lot of time, patience, and attention to detail to get this wall. We had a 3D wall early on. Remember those diamonds we had earlier? Well, here is another wall that tries to put emphasis on depth and texture. 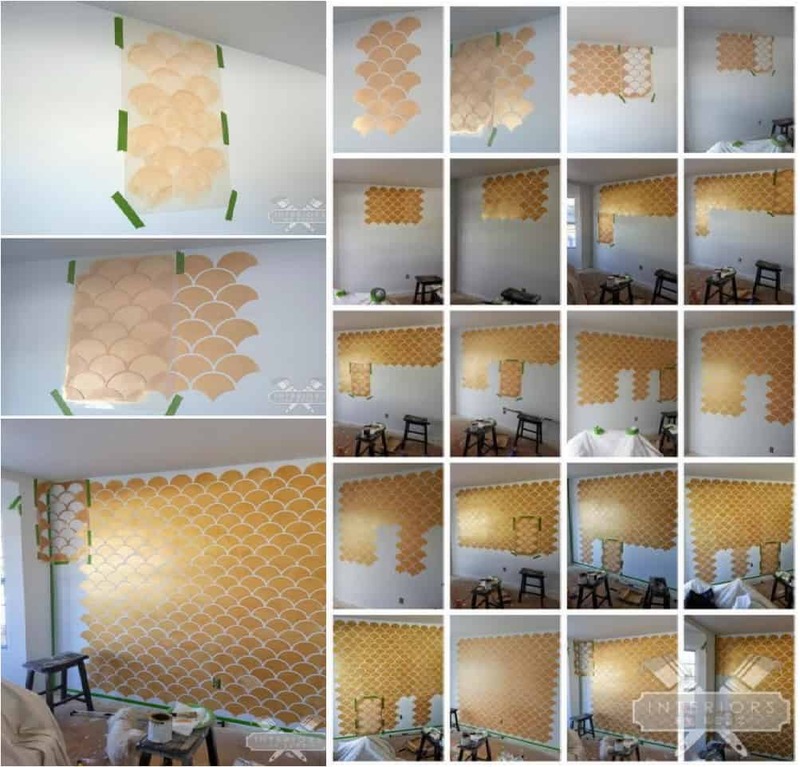 The best part about the hexagon accent wall is potential. In other words, potential for so much experimenting in terms of coloring. You can paint the hexagon in one, two, three, four, or how many colors you want. It all depends on your preferences and how dynamic you want the wall to be. We have another faux brick wall as well. I always like to give more than one options from a single idea to my readers. After all, not all of us want the classic faux brick wall. When it comes to accent wall, I believe contemporary and modern homes are easiest. The reason is because you just have to stick to something elegant, and you are good to go. We had the ombre, and we have the chevron as well. On first glance, these two have nothing in common. But my experience shows that these two aspects are probably the most commonly used techniques in different industries. I’ve seen the chevron in hairstyles, manicure, fashion, and interior design. For the very end, I want to give you the classic chalkboard treatment. While all of the accent walls previously served a decorative purpose, this one can serve a practical purpose as well. You can write anything you like, and then wipe it clean in the evening. With that in mind, I leave you to try some of the interior design ideas we looked at. I am sure you can make it. 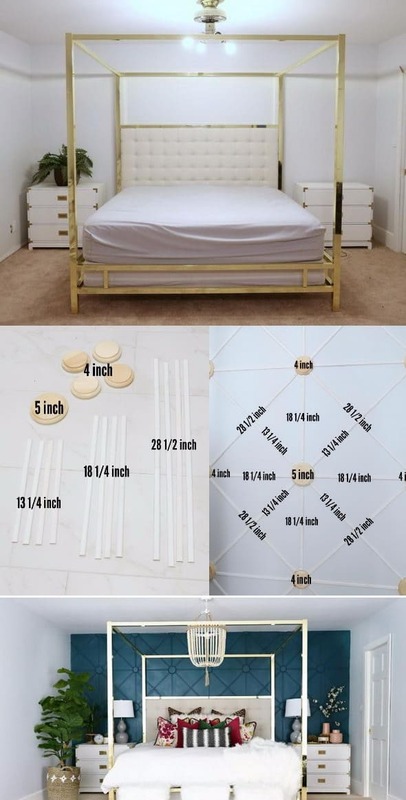 After all, they are all simple and easy DIY projects.